Published on April 23, 2015 by Martyn. Be the first to comment! They say it’s never dull in Hull, well that was certainly true this week when bright Spring sunshine bathed the city during my busy but very enjoyable two-day stay. I was there at the invitation of Hull City Council’s Library Service to visit some of the schools taking part in the 2015 James Reckitt Hull Children’s Book Awards, for which Never Ending has been shortlisted. During my trip, I called in at no fewer than five schools – Kelvin Hall School, The Boulevard Academy, Thomas Ferens Academy, Kingswood Academy and Winifred Holtby Academy – to give talks and readings, followed by question-and-answer sessions and book-signings. In total, nearly 300 students from years 7, 8 and 9 attended the events and I’m grateful to the teachers and librarians who hosted my visits, and to Tracey Acum of Hull libraries, who set up the mini-tour and chauffeured me around the city. I’m pictured with two students at Kelvin Hall, with thanks to the school’s website for my reproduction of the image here. This is the second time I’ve been shortlisted for the Hull award – my debut teenage novel, Flip, was one of the runners up to Annabel Pitcher’s My Sister Lives on the Mantelpiece in 2012. 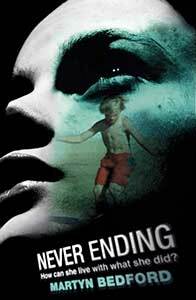 Never Ending is shortlisted in the secondary schools (KS3) category, along with Captain, by Sam Angus, A Dark Inheritance, by Chris D’Lacey, The Apple Tart of Hope, by Sarah Moore Fitzgerald, and Memoirs of a Neurotic Zombie, by Jeff Norton. Hundreds of students at participating schools across the city have been reading and discussing the five books over the past few months and voting takes place next week, when I’ll be returning to Hull for the final awards event.